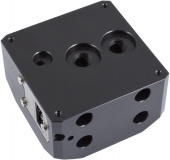 The Aqua Computer pump adapter for D5 pumps is manufactured from durable Delrin. The adapter can either be used as a stand-alone pump adapter or in combination with a compatible aqualis series reservoir. 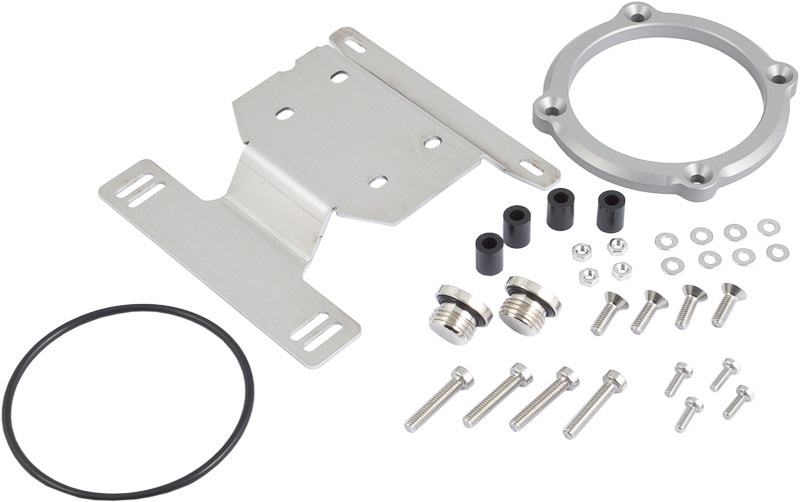 A mounting bracket made from stainless steel is included in delivery, an optional decoupling set can also be used (not included in delivery). For mounting a D5 series pump, an anodized aluminum clamp ring and a suitable o-ring gasket are provided. When used with an aqualis base series reservoir, pump adapter and reservoir form a virtually seamless unit. The sockets at the base of the reservoir slide into form-fitting receptables of the pump adapter and the gaskets on the sockets establish a watertight seal. When used with a reservoir, the threads on the side of the pump adapter must be used to connect the water loop. 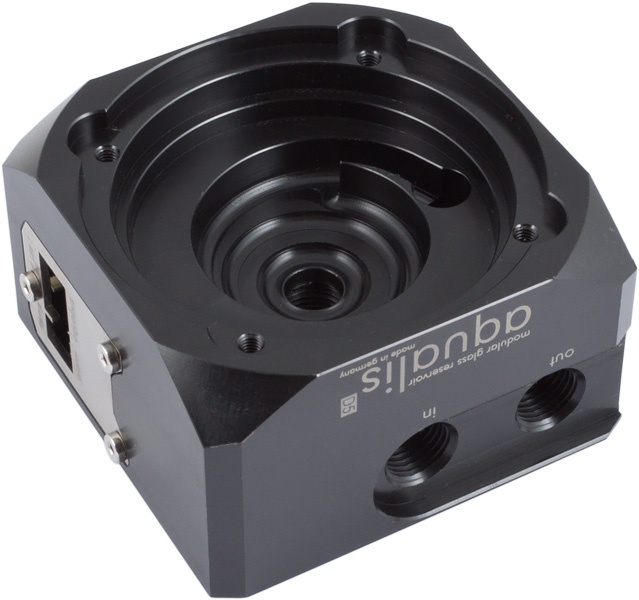 Additionally, a fill level sensor of the mps series is integrated into the pump adapter. The fill level sensor features an integrated microcontroller with USB and aquabus interface, a programmable alarm output and an external temperature sensor input. For monitoring and configuration, the aquasuite software can be downloaded free of charge. In addition to the USB interface, the 4-pin aquabus interface can be used to directly connect the flow sensor to an aquaero 5/6 controller (not included in delivery). The alarm output can be configured to be used as a rpm signal to be connected to a fan connector with fault detection (for example motherboard fan headers) or to be used as a switched output for example to connect a LED. Fill level and external temperature sensor input can be configured to raise an alarm. The external temperature sensor input is compatible with all Aqua Computer temperature sensors. A pressure equalisation membrane is included in delivery of the pump adapter and is to be installed into the top port of the reservoir. When used without an aqualis base series reservoir, the fill level sensor is not operational! G1/4 threads for fittings can be used on the top and side of the pump adapter. Unused threads can be sealed with two G1/4 sealing screws supplied with the pump adapter. Pump, fittings and reservoir are not included in delivery! This product was added to our catalogue on Thursday, 19. July 2012.